Jerome Leon Bruckheimer (born September 21, 1943) is an American film and television producer. He has been active in the genres of action, drama, fantasy and science fiction. His best known television series are CSI: Crime Scene Investigation, CSI: Miami, CSI: NY, Without a Trace, Cold Case, and the U.S. version of The Amazing Race. At one point, three of his TV series ranked among the top 10 in the U.S. ratings—a unique feat in television. Some of his best-known films include Flashdance, Top Gun, The Rock, Con Air, Armageddon, Enemy of the State, Black Hawk Down, Pearl Harbor, and the Beverly Hills Cop, Bad Boys, Pirates of the Caribbean and National Treasure franchises. He also serves as a Director at ZeniMax Media. Many of his films have been produced by Disney and Paramount, while many of his television series have been co-produced by Warner Bros. and CBS Television Studios. In July 2003, Bruckheimer was honored by Variety magazine as the first producer in Hollywood history to produce the top two highest-grossing films of a single weekend, Pirates of the Caribbean: The Curse of the Black Pearl and Bad Boys II. He is also the co-founder and co-majority owner (along with David Bonderman) of the future National Hockey League team in Seattle. Bruckheimer was born in Detroit, Michigan, the son of German-Jewish immigrants. He graduated from Mumford High School in Detroit, at age 17, before moving to Arizona for college. Bruckheimer was also an active member of the Stamp Collecting Club. He graduated with a degree in psychology from the University of Arizona. He was a member of the Zeta Beta Tau fraternity. A film buff at an early age with an interest in photography, Bruckheimer would take snapshots when he had the opportunity. After college Bruckheimer worked in advertising in Detroit and New York City. During the 1980s and 1990s, he was a co-producer with Don Simpson of a string of highly successful Hollywood films for Paramount Pictures. He originally met Don at a screening of 1973's The Harder They Come at Warner Brothers. The two worked together and created Bruckheimer's first big hit, 1983's Flashdance, which brought in US$95 million. He had a number of other hits during that time period, including the Beverly Hills Cop films, Top Gun and Days of Thunder. Top Gun marked his first collaboration with English director Tony Scott, who would direct six films for Bruckheimer. 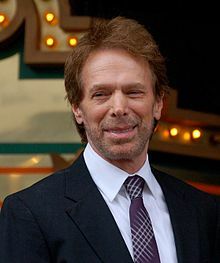 While working with Simpson, Bruckheimer became known as "Mr. Outside" because of his experience with film making, while Simpson became known as "Mr. Inside" because of his film industry contacts. The Rock was the last film in which Bruckheimer collaborated with Simpson, due to Simpson's death in 1996. Bruckheimer stipulated that The Rock be dedicated to the memory of Simpson (this fact is mentioned at the end of the film). 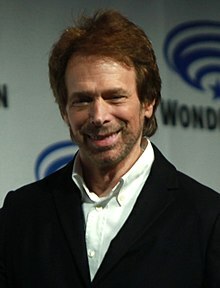 Despite the setback of the untimely death of Simpson in 1996, Bruckheimer has continued to produce a large number of action films often working with director Michael Bay for several hits including Armageddon. His other hit films produced include Remember the Titans, Black Hawk Down and the Pirates of the Caribbean series. He has also acquired the rights to produce a film based on the popular role playing game by Palladium Books, Rifts. Early in his career, Bruckheimer produced television commercials, including one for Pepsi. Since 1997 he has branched out into television, creating a number of police dramas of which CSI: Crime Scene Investigation has been the most successful. He has also produced the reality game show The Amazing Race. In May 2008 CBS announced it had picked up Bruckheimer's newest series, Eleventh Hour, for the 2008–2009 broadcast television season. The science fiction drama follows a government agent and a professor as they investigate strange scientific and medical activity. From 2004 (beginning of CSI: NY) to 2009 (end of Without a Trace), Bruckheimer had six hit television shows on the air: CSI: Crime Scene Investigation, CSI: Miami, CSI: NY, Cold Case, Without a Trace and The Amazing Race. At one point, three of his TV series ranked among the top 10 in the ratings. It was announced on September 10, 2009 that NBC had picked up an action procedural from Jerry Bruckheimer. The show, titled Chase, "tells the stories of a team charged with making sure fugitive criminals don't evade justice," reports The Hollywood Reporter. It was canceled in May 2011. Bruckheimer's most notable flop was Skin, which was cancelled after three episodes in 2003. In June 2016, Jerry Bruckheimer Television became an Independent outfit, ending a 15-year run exclusive pact with Warner Bros. Television. One of the most successful producers of all time, Bruckheimer has been nicknamed "Mr. Blockbuster", due to his track record of commercially successful, high-grossing films. Overall, his films have grossed over $13 billion and have launched the careers of numerous actors and directors. In 2007, he was ranked No. 39 on Forbes Celebrity 100 List, up from No. 42 in 2006. With reported annual earnings of $120 million, he was the 10th highest money-earner on the 2006 Forbes Celebrity 100 List. 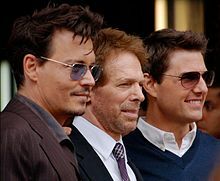 In July 2003, Bruckheimer was honored by Variety magazine as the first producer in Hollywood history to produce the top two highest-grossing films of a single weekend, the buddy-cop Bad Boys II and the Disney theme-park spin-off, Pirates of the Caribbean: The Curse of the Black Pearl. The Pirates of the Caribbean film trilogy, produced through Walt Disney Pictures, was enormously profitable, and demonstrated Bruckheimer's ability to create lucrative projects. Pirates of the Caribbean: The Curse of the Black Pearl, the first film in the franchise, was released on July 9, 2003. A popular box office hit, it was well received by critics and filmgoers alike. After the unexpected success of the first film, Walt Disney Pictures revealed that a trilogy was in the works. Pirates of the Caribbean: Dead Man's Chest was released on July 7, 2006. The sequel proved to be very successful, breaking records worldwide the day of its premiere. In the end it acquired a total of $1,066,179,725 at the worldwide box office, becoming the third and fastest film to reach this amount. The third film in the series, Pirates of the Caribbean: At World's End, was released worldwide on May 25, 2007. Altogether, the film franchise has grossed over $2.79 billion worldwide. Two more films, Pirates of the Caribbean: On Stranger Tides and Pirates of the Caribbean: Dead Men Tell No Tales, were released, in 2011 and 2017, respectively. The editors of Entertainment Weekly named Bruckheimer the No. 1 most-powerful person in Hollywood in 2003. He was ranked No. 10 on Premiere's 2006 "Power 50" list, and had also ranked No. 10 on the 2005 list. He ranked No. 19 on Premiere's 2003 annual Hollywood Power List, and had ranked No. 22 in 2002. His projects have been honored with 41 Academy Award nominations (six wins), eight Grammy Award nominations (five wins), 23 Golden Globe nominations (four wins), 77 Emmy Award nominations (seventeen wins), eight People's Choice nominations (four wins), and numerous MTV Awards, including one for Best Picture of the Decade. Bruckheimer received the ShoWest Producer of the Year Award in 1998 and in 2000 the Producers Guild honored him with the David O. Selznick Award for Lifetime Achievement.In May 2006, he was honored with a doctor of fine arts degree (DFA) from the University of Arizona's College of Fine Arts. On June 24, 2013, Bruckheimer received a star on the Hollywood Walk of Fame, placed right by El Capitan Theatre on Hollywood Boulevard. When asked about his favorite films, Bruckheimer named The Godfather (1972), The French Connection (1971), Good Will Hunting (1997), and The 400 Blows (1959). When asked on what the film industry's obligation to an audience was, he responded, "We are in the transportation business. We transport audiences from one place to another." When asked why he makes films, he stated, "If I made films for the critics, or for someone else, I'd probably be living in some small Hollywood studio apartment." Bruckheimer has been married twice. His first wife was Bonnie Fishman Bruckheimer. He currently lives in Los Angeles, with his second wife, novelist Linda Cobb Bruckheimer. He also has one stepdaughter, Alexandra. The couple owns a farm in Bloomfield, Kentucky, about 20 miles (32 km) southeast of Louisville, as well as another in Ojai, east of Santa Barbara. As a teenager, Linda moved from Kentucky to Los Angeles, where she has been a writer, producer and West Coast editor for Mirabella, and where she married Bruckheimer. She regularly spends time as a preservation activist, restoring and preserving historic buildings in small rural U.S. towns. His film company, Jerry Bruckheimer Inc. (doing business as Jerry Bruckheimer Films), is located in Santa Monica, California. Bruckheimer's philanthropic activities have included publicly supporting the fight against multiple sclerosis via his work with The Nancy Davis Foundation for MS. He has additionally pledged to help various causes by establishing the Jerry Bruckheimer Foundation. However, according to The Smoking Gun, the last time the Jerry Bruckheimer Foundation made a contribution was in 1995, when it gave $9,350 to Van Nuys prep school. Bruckheimer has aided in the repair and restoration of the historic clipper ship Cutty Sark. A collection of photos taken by Bruckheimer went on display in London in November 2007 to help raise money for the Cutty Sark Conservation Project. The exhibition featured more than thirty pictures taken on set during the filming of Pirates of the Caribbean: At World's End. Bruckheimer has donated more than $50,000 to Republican campaigns and committees. Bruckheimer donated funds to John McCain's 2008 presidential election campaign. He gave $5,000 to a joint fundraising committee on John McCain's behalf. Bruckheimer donated $25,000 to the 2012 Mitt Romney Victory Fund. Bruckheimer was named as one of the investors of a proposed sports arena in Las Vegas, and had been rumored to be the leading choice by the National Hockey League (NHL) to own an expansion hockey team that would play in the arena. Bruckheimer was also named as one of the investors of a proposed Seattle-based NHL expansion team whose application was submitted in early 2018. The NHL Board of Governors voted to approve the Seattle NHL team on December 4, 2018 and will start play in the 2021-2022 Season. In December 2007 Bruckheimer announced plans to partner with MTV to create a new game studio. The same year Bruckheimer joined the ZeniMax Media board of directors and has since showed up at several launch parties for Bethesda Softworks titles including Fallout 3, Fallout: New Vegas, and The Elder Scrolls V: Skyrim. In 2009 Bruckheimer unveiled Jerry Bruckheimer Games headed by former Microsoft Studios Publishing Executive Producer Jim Veevaert as president of production and Jay Cohen, previously Ubisoft's vice president of U.S. publishing, as president of development. In 2011 it was rumored that Jerry Bruckheimer Games was working on three titles, but nothing came out of it ever since. In March 2013 Jerry Bruckheimer Games was closed. Although Jerry Bruckheimer Games is closed, Bruckheimer still remains a ZeniMax board member to this day, mostly due to being a close associate of ZeniMax President Ernest Del. The Legacy was shot for UPN's 2002–2003 season, written by Simon Kinberg and directed by Jim Gillespie. The Legacy is a science fiction drama that tells the story of a young assistant District Attorney Sam (Matthew Marsden) who inherits superpowers and must juggle the responsibility with his existing job and girlfriend Jess. An HBO television series inspired by Cocaine Cowboys was in the works, with Jerry Bruckheimer, Michael Bay, Alfred Spellman and Billy Corben serving as executive producers. It was intended to chronicle the early days of cocaine trafficking in Miami, and was being produced by HBO sister company Warner Bros. Television, where Jerry Bruckheimer TV is based. Family Crimes was created by David Ayer and was passed over by Starz. ^ Howell, Peter (December 22, 2007). "Jerry Bruckheimer". The Star. Toronto. Retrieved May 6, 2010. ^ "1961 Mumford High School Yearbook". classmates.com. ^ Smith, Raymond E. (March 13, 2012). How Did They Get So Rich?. BookBaby. ISBN 9781620954959. ^ "Movies: Biography forJerry Bruckheimer". The New York Times. Retrieved May 6, 2010. ^ Rich, Katey (June 12, 2009). "Interview: Tony Scott". Cinema Blend. Retrieved January 3, 2013. ^ Adalian, Josef. "CBS Picks Up 4 New Dramas, 2 Comedies". TV Week, May 2008. Accessed August 27, 2009. ^ Laura Prudorn (January 11, 2010). "Will New Shows From J.J. Abrams, David E. Kelley and Jerry Bruckheimer Save NBC?". AOL. Retrieved March 28, 2010. ^ Natalie Abrams (September 10, 2009). "NBC Green-lights Bruckheimer Pilot". TV Guide. Retrieved September 11, 2009. ^ Debra Birnbaum and Cynthia Littelton (June 9, 2016). "Jerry Bruckheimer Television Goes Independent, Ending 15-Year Run with Warner Bros. TV". Variety. Retrieved June 10, 2016. ^ a b "Jerry Bruckheimer @ Filmbug". Filmbug.com. October 2, 2005. Retrieved January 21, 2013. ^ "#39 Jerry Bruckheimer". Forbes. June 14, 2007. ^ "Producer Jerry Bruckheimer receives Hollywood Walk of Fame star". KABC-TV. June 24, 2013. Retrieved June 24, 2013. ^ Paul Ahnert. "Ahnertthoughts". ahnertthoughts.blogspot.co.uk. ^ "Belle of bluegrass country". Variety. July 9, 2006. ^ "You Can Go Home Again". Nettiejarvis.com. November 28, 1999. Archived from the original on November 15, 2013. Retrieved January 21, 2013. ^ "Top 49 Men: Jerry Bruckheimer". AskMen.com. Retrieved January 21, 2013. ^ "NEWSMEAT ▷ Jerry Bruckheimer's Federal Campaign Contribution Report". Newsmeat.com. Archived from the original on January 16, 2013. Retrieved January 21, 2013. ^ "Top of the Ticket". Los Angeles Times. July 21, 2008. Retrieved May 6, 2010. ^ "Celebs open their wallets in White House race, mostly for Obama". CNN. July 24, 2012. ^ Nick Christensen. "Report: Harrah's out as proposed arena partner". lasvegassun. Retrieved January 21, 2013. ^ Associated Press (February 20, 2018). "Seattle launches season-ticket campaign for new NHL team". newyorkdailynews. Retrieved February 22, 2018. ^ "Bruckheimer Joins With MTV to Create New Game Studio". The Escapist. December 19, 2007. ^ Kelly, Kevin. "The incredibly strange and delightful Fallout 3 launch party". Joystiq. ^ "The Escapist : Forums : The News Room : Jerry Bruckheimer Unveils Jerry Bruckheimer Games". The Escapist. ^ Schramm, Mike. "Rumor: Jerry Bruckheimer Games working on three titles". Joystiq. ^ Makuch, Eddie. "Jerry Bruckheimer Games closed". Gamespot. Archived from the original on September 26, 2013. ^ Fritz, Brian (October 6, 2010). "Video game publisher Zenimax raises $150 million from Providence Equity". Los Angeles Times. ^ Andreeva, Nellie (April 27, 2018). "'Family Crimes' Drama From David Ayer & JBTV Not Going Forward At Starz". Deadline. "Jerry Bruckheimer collected news and commentary". The New York Times.